Ted Ujifusa has been at Harker since 2008. 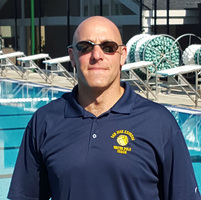 He coaches the upper school boy’s varsity water polo team and the middle school coed team. Starting in 1974 as an assistant coach at San Jose City College, he has been an assistant coach for both the men’s and women’s programs at the University of California, Berkeley, head women’s coach at San Jose State University, head men’s and women’s coach at De Anza College (Cupertino, CA), head men’s coach at Leland High School (CCS champions), and head men’s co-coach at Cupertino High School (CCS champions). He has developed over 50 All-Americans at various competitive levels. His Club U men’s team were USA Water Polo 35&Over Senior Men’s national champions (1994). He is co-founder and current president of San Jose Express. He was First Team All-League (S.T.A.L) and his team was the first in his high school’s history to win a water polo league championship (1969). He is the first ever minority to be recruited to play for and later earned a varsity letter at Cal. His Concord club were Junior Olympic champions in 1971. Other accomplishments include Coast Conference Coach of the Year (De Anza College. Coast Conference league champions. 1995.) His 2009, 2013, 2015, and 2016 upper school teams were Central Coast Section (CCS/CIF) academic champions. The 2015 and 2016 teams were also California state academic champions. The 2016 upper school team is also Harker’s first league champions. He is the only coach in CCS history to win championships at two different public high schools. He is also the only person in CCS to win a championship as a coach and referee a section championship game (three). In 2016, Mr. Ujifusa was selected as CCS Honor Coach for the sport of water polo. He was inducted into the Lincoln High School (San Jose, CA) Athletic Hall of Fame in 2011. Born in Tokyo, Mr. Ujifusa is a long time resident of San Jose. He enjoys surfing, playing piano and acoustic guitar, and is a Silver Life Master in bridge. Dr. Adler teaches math at the Harker School and has coached Harker's varsity boys water polo team since 2008 as well as assisting with the JV boys team. He played club water polo at Duke for four years and founded, played on, and coached the club team at his graduate school, the University of Rochester. In three years from its inception, he led that team to an appearance in CWPA Club National Championships and was named conference coach of the year. He has also refereed at Club National Championships. He has played with Bay Area Masters team. Former pro-water polo athlete and Olympian, Sasha Potulnitsky has dedicated over 35 years to the sport. As a native born Ukrainian, he is a well known, highly decorated gold, silver and bronze medalist, as well as an honored team member of the “Dynamo” Lvov Water Polo Club, Lvov, Ukraine. During his pro-water polo career, Sasha represented Ukraine at numerous international competitions and cups, and led his Ukrainian Olympic Team as Captain for the 1996 Atlanta Olympic Games. Sasha has been coaching in the United States since 2005 as a Head Coach at The European Water Polo Club and Second Coach at the Stanford Water Polo Club in Palo Alto, CA. He was also the head coach of Los Gatos boys varsity water polo team for several years. Sasha brings an incredible depth of knowledge, experience and absolute love for the sport. His coaching philosophy is founded on building strong friendships, teamwork, and discipline as he develops in his players a passion for the sport of water polo. Coach Ron has been involved in aquatics in the South Bay for over 30 years. He coached at Foothill College and had many state and national champions, numerous high schools and age-group teams. He's known for teaching swimmers to have great strokes, have fun and swim fast. Currently, he works as an Adapted PE Specialist for Santa Clara County. Davor hails from one of the global hotbeds of water polo, Croatia. He grew up playing for one of the premier clubs Mladost, Zagreb. His teams won the Croatia Cup and Championship of Croatia several times as well as many European International tournaments. He was on the Youth Croatian National Team. He attended West Valley College where he was coached by Bruce Watson, and earned an AA degree in Liberal Arts while winning the NorCal Water polo Championships in 2013 and finishing 4th in the States Championship the same year. He then attended San Jose State University, where he played on its varsity team from where he recently graduated in Computer Science and Mathematics. He earned both, NCAA All-American Athletic and Academic Awards in 2016 and 2017. He is currently the head coach of Los Gatos Varsity boys water polo team. ​Peter has been playing water polo since he was 12 years old. He attended Saint Patricks High School in Chicago IL, and played varsity water polo for all four years of high school. After high school, he moved to San Jose and spent two years attending West Valley College and playing water polo. He also played one year of varsity water polo at Chapman University in Orange, California. He then attended and graduated from SJSU with Business and Economics degree. He was the head coach of Harker's boys JV team for a several years as well as assistant coach of their varsity team. Peter is currently the assistant coach of Los Gatos Varsity boys water polo team. ​Sachi started her water polo career at age 7. She played on various club teams in the Bay Area all throughout grade school. After taking a break from the sport to live in Santa Monica, she returned to train and practice with the women's team at West Valley College in 2010. She is currently pursuing a degree in Biology in hopes of eventually becoming a teacher. Water polo has always been a joy for Sachi and she is so grateful to be able to share it with a new generation. Tania Chadwick grew up in Southern California and started her competitive swimming career at six years old and retired as a nationally ranked collegiate swimmer. At Golden West College she was an All-American in 19 events and notched four school in 1988. She was also named Athlete of the Year in the South Coast Conference. At Cal Poly she finished 3rd place at NCAA's in 500 and 1650 Freestyle. She held records in the distance freestyle events for 19 years and is still currently ranked second all-time at Cal Poly. She has taught private swim lessons and assisted on the swim team at her alma mater, Cal Poly, San Luis Obispo. Coach Tania highlights the importance of good sportsmanship and positive life lessons that comes from participating team sports. She has been coaching adults and high school students in competitive dog agility for 13 years, helping them to achieve their competition goals at the national and international level. She still enjoys swimming and loves to compete in triathlon relays. She has a son that plays hockey and a daughter that swims. Coach Yuri has been swimming since the age of 4. She played water polo and swam throughout high school. She also competed in both sports at West Valley College. In swimming she finished 2nd in the Coast Conference Championships in 2015 in the 100 Freestyle. In water polo, she helped WVC helped to a NorCals appearance. She is now attending University of La Verne where she plays on their girls varsity water polo team. She has been Express's main swim coach for the younger kids and helped get them comfortable enough to play water polo. Evin is excited to join the San Jose Express family as he continues his water polo career on the dry side of the pool. He has been an active part of the of Bay Area water polo community, playing for Los Gatos High School and later for the varsity and club programs at the University of California, Berkeley where he received a degree in Molecular Biology. Evin is also an All-American swimmer and is experienced with teaching younger and older children the fundamentals of swimming. Outside of the pool, Evin is currently involved in advancing DNA sequencing in the hopes to improve the understanding and treatment of rare genetic diseases. ​A Bay Area native and has been playing water polo since the age of 13. While attending Wilcox High School and playing on their varsity water polo team since he was a freshman, he also played for a variety of clubs, including West Valley and Stanford Water Polo Clubs. While playing for Wilcox High School, he achieved many all-league and team awards. Lee then went on to play at West Valley College, wining the NorCal Championship and placing 3rd in state. He then transferred to Arizona State University, where he also played for their club team winning a Rocky Mountain League Championship. His roots of coaching began in swimming at the age of 14, soon progressing to water polo as a club and JV coach. He is now beginning his third year as Wilcox’s head varsity coach. He has won a league championship both as a player and coach at Wilcox HS.. Lee is currently attending CSUEB earning his Teaching and Counseling Credentials. With over 40 years of coaching water polo under his belt, Alex is truly a legend. His rich history of coaching starts with the Sports Academy in Ukraine, Ukrainian National Team, growing Soviet Union Youth to take gold medals consequently at numerous national and international championships. He is a honored coach of Ukraine and USSR. Most recently, Alexander was a Head Coach of the Dutch Water Polo team. He is a master of water polo strategy, skills training, team discipline, and personal motivation. More importantly, Coach Boiko teaches the love of the sport and teamwork, and winning together as a family which has led to many life-long friendships!